Growing up I loved nothing more than to find a good book, sit down in a corner and read. Thankfully my little apples didn’t fall too far from the tree and both of my boys adore reading. It’s not at all uncommon for me to walk into their rooms and find them sitting next to a pile of books and to say that their bookshelves are overflowing would be an understatement. As a mom, fostering this love of reading in them is important to me year round but during the month of March (which happens to be National Reading Month just in case you didn’t know), it’s even more important. The best way I’ve found to do this is by pairing my little guy’s Echo Dot Kids Edition with his favorite books to help make reading even more of a fun past time than it already was. 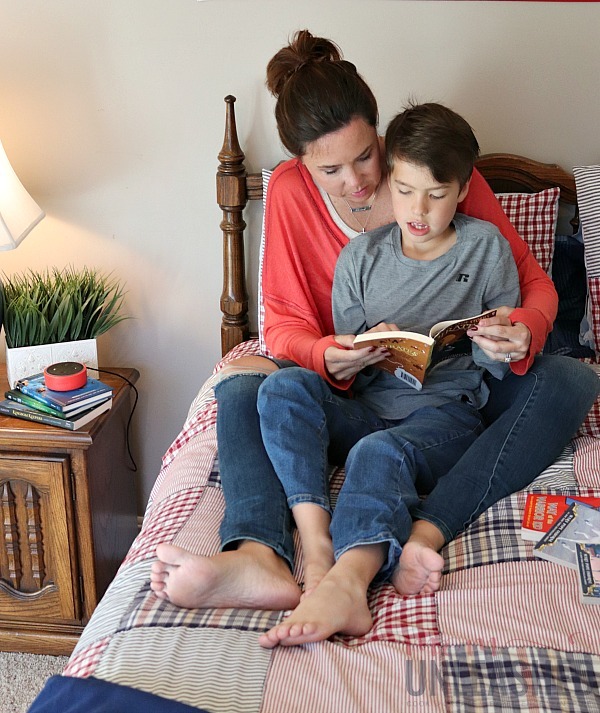 Whether your kiddos are just learning to read, are already totally in love with books or are needing a way to make reading more fun, read on to discover my five ways the Echo Dot Kids Edition helps make reading fun. I adore that my children have always loved to lose themselves in the pages of a book. 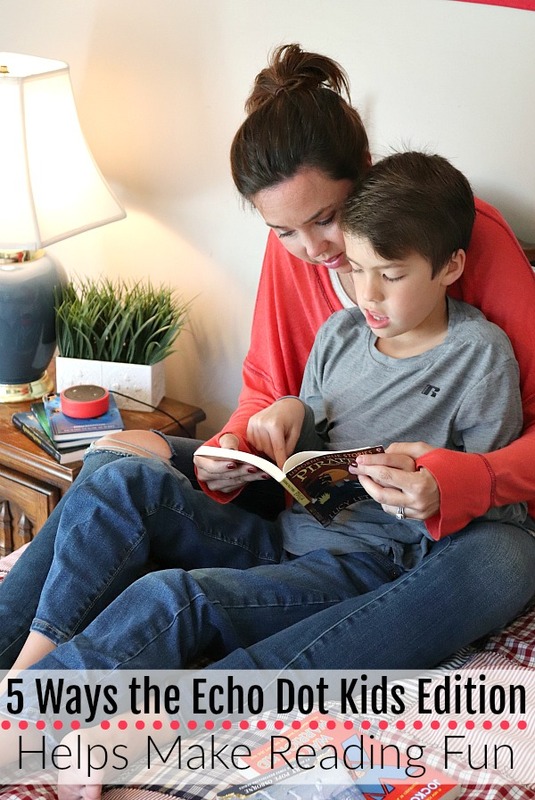 However, as any mom knows as reading levels progress and reading needs change, it can often be challenging to keep up and help your children develop a love of reading at their own pace. 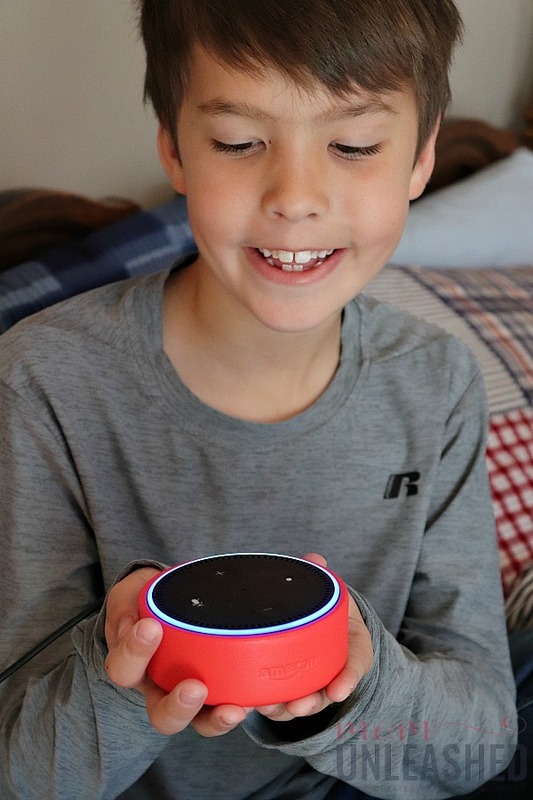 As most of you know, we were already in love with our Amazon Echo devices when my little guy received his Echo Dot Kids Edition with Amazon FreeTime. 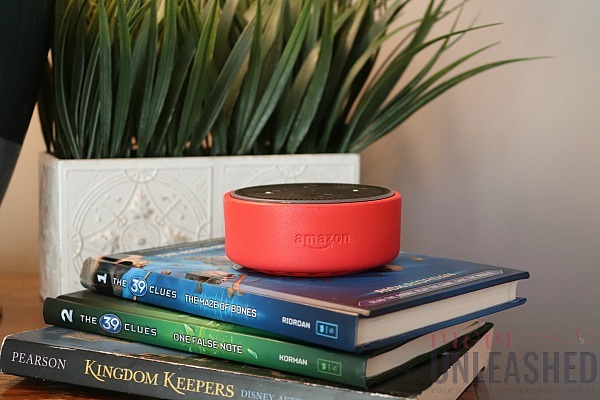 Now, we’ve discovered that our Echo Dot Kids Edition and Alexa are the perfect companions to help develop reading skills and make favorite books even more fun. Here are the top ways we’ve been using our beloved device to celebrate National Reading Month. My little guy chooses to read over pretty much any other activity (yes, I’m so proud!) but I’ll admit that there are times when he wants to go read in his room without having to run up and down the stairs asking me what this word is or what that word means. I’ll be honest and say that as his reading level has progressed and he’s fully delved into more complicated chapter books, this is one area we struggled with them most. But now, our Echo Dot Kids Edition has come to the rescue. How you ask? Well, quite simply he can grab his book, jump in his bed and read away. When he gets to a word he doesn’t know, he simply asks “Alexa, what does this word mean?” or “Alexa, what does this spell?”. Instantly, he has a helper who can tell him how to pronounce the words he spells or and give him definitions so that what he’s reading really makes sense. Since he’s started asking Alexa for help as he reads his books, he’s become more independent and fallen even more in love with the ability to have “his time” and read alone. While I love that he can get help from his Echo Dot Kids Edition as he reads, I also love that he can find new books that he adores through Amazon FreeTime via Amazon Storytime and Audible. There are literally over 1,000 Audible Books available on Amazon FreeTime and all he has to do is ask Alexa to read him a story and he’s off on a new adventure. 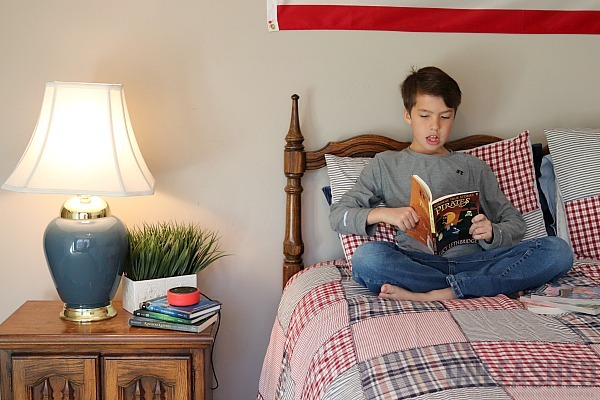 While this does not take the place of his wanting to read an actual book, it’s helped him discover so many new stories and new series that he then wants to read himself. In the same line as the Audible and Amazon Storytime books that he’s discovered, we’ve also learned that he can ask Alexa to read some of his favorite books while he follows along. He happens to be obsessed with the Magic Treehouse series right now and he loves that there is the ability to have the actual author read the books aloud for him as he follows along. He can grab his book, lay down on his bed and simple say “Alexa, read the Magic Treehouse series”. Then all he has to do is follow along on the pages as the author reads her own words. I’ll admit that he’s read these books quite a few times and having the ability to hear them read aloud has sparked his love for them anew. While my little guy uses the Echo Dot Kids Edition to have words defined or learn how to say them, one of our favorite things to do together is read books about history and geography. We love fact books and books that are historical fiction. Once we’ve read through the books, we can ask Alexa to tell us more about pirates, whales, far-off locations and more. We’re able to read his stories and become immersed in them. Then, when we’re ready to take a little break, we can use that time to ask Alexa to tell us more about the subject we were just reading. This has been such a great learning tool for us and has helped us turn regular books into a fabulous way to learn. I kid you not when I say that my little guy now walks around spilling out facts that he became curious about through the pages of a book and then delved deeper into through all the knowledge that Alexa possesses. From science to spelling to definitions to just about any topic he can come up with, Alexa is ready to help. It’s really the perfect way for him to learn since Alexa continues to get smarter and add new information each and every day. 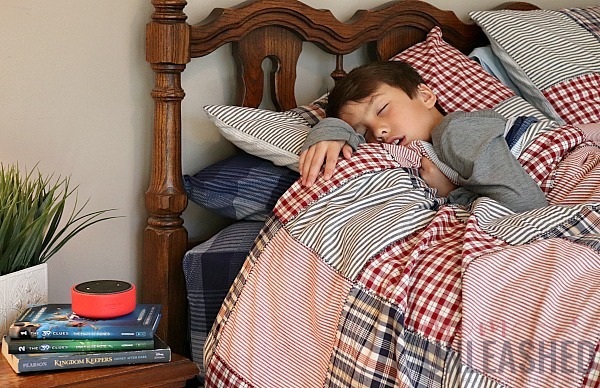 While I do love for him to be hands on with reading most of the time, I also adore that our Echo Dot Kids Edition allows his love of books to spill over into his nighttime routine. When it’s time for him to lay down and go to sleep he can simply say “Alexa, read me a story” and I can rest assured that he’s hearing an age-appropriate tale as his little brain heads into sleep mode where he will most assuredly dream about all the adventures he’s discovered in his books during the day. While Alexa on the Echo Dot Kids Edition has endless learning opportunities and always has something new to teach not only my little guy but our whole family, we love how much more fun it has made reading. 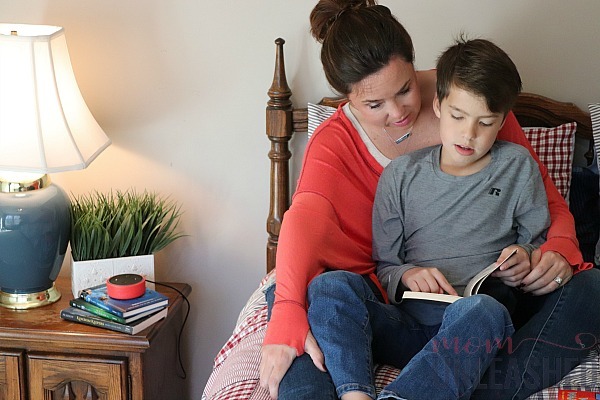 We’ve always been a family of readers and I know that the Echo Dot Kids Edition is taking a love of reading to a whole new level for my child, not only during National Reading Month but all year long. Would you like to help your child fall in love with reading and learning in an amazingly interactive way with help from the Echo Dot Kids Edition. 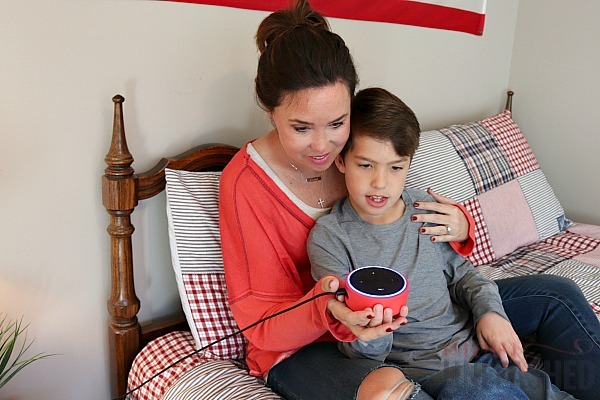 With Amazon FreeTime that features over 1,000 kid-friendly books that can be read through Audible, a Parent Dashboard that allows you to control what your child has access to and when they can interact with Alexa and endless learning opportunities and games in science, match, spelling and more, the Echo Dot Kids Edition is the perfect way to make not only reading but learning in general fabulously fun for the whole family. Even better, now you have a chance to win one of 10 Echo Dots to bring learning to life in your home. From March 13-April 3, simply enter using the form below. 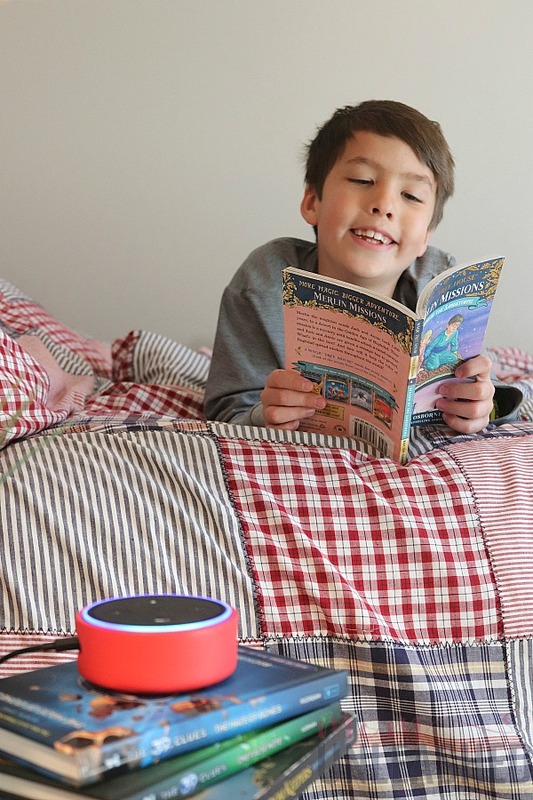 Then try for yourself any of the five ways we’ve found to make reading fun with our Echo Dot Kids Edition or discover your own favorite endless skills, activities, learning tools and more! Now tell me, how does your child use their Echo Dot Kids Edition to make reading more fun? I love the Echo Dot Kids. It’s a great way for them to be able to take advantage of today’s tech in a manner that helps improve their life. Mine are always asking about definitions, too. And when you’re snuggled up with a good book, it’s hard to get up constantly for answers! This is so awesome! I love anything that helps making reading fun and enticing for kids. I am going to have to look into this. I have an old echo (one of the originals), but I have been wanting to upgrade to a DOT! My kids would love an Echo Dot. They do all have the Fire Tablets but they keep asking for one of these. My son likes to play audible books on his echo dot too. it is also nice for alarms and things like that. wow! This is for sure and interesting and useful device! My kids will love it! That sounds so much fun! Thank you so much for your ideas! We love our Amazon Echo Dot. I need to try the reading options. How fun! My kids would have loved this when they were little. Jennifer recently posted..Homemade Ranch Dressing &#8212; Perfect for that Steakhouse Salad! This sounds fun! My niece loves reading and most of the time she asks for the meaning of some words too. This would be so awesome! I love this so much and had no idea this was a function of the Echo. What a great thing for kids!